THE THANKSGIVING LUNCHEON AND THE WEDDING! Canon 70-200mm f/2.8 L IS lens (handheld at 70mm) with the EOS-1D MIII. ISO 400. Evaluative Metering +2/3 stop: 1/25 sec. at f/5.6. I used 45-point AAFPS to create this image; it always worked well in flocks-in-flight situations even before I installed the new firmware (see below). Despite the fact that photographic conditions were far less than ideal for a variety of reasons (see more below), everyone in all three groups went home extremely happy. We worked very hard not only to put each group in the best position but to explain to folks the factors that influenced our decisions. These always include the weather, the lighting conditions, the wind direction, and recent bird behavior. We do this so that folks will be able to apply the principles that they have learned when they get back to their home turf or when they visit new locations on their own. As usual, the attending Posse members provided great help to everyone on the IPTs including me. Each of them is a superb teacher and I thank them for their efforts. Robert O’Toole was with us for all three IPTs, provided great in-the-field instruction and inspiration; he is always coming up with new and creative techniques. 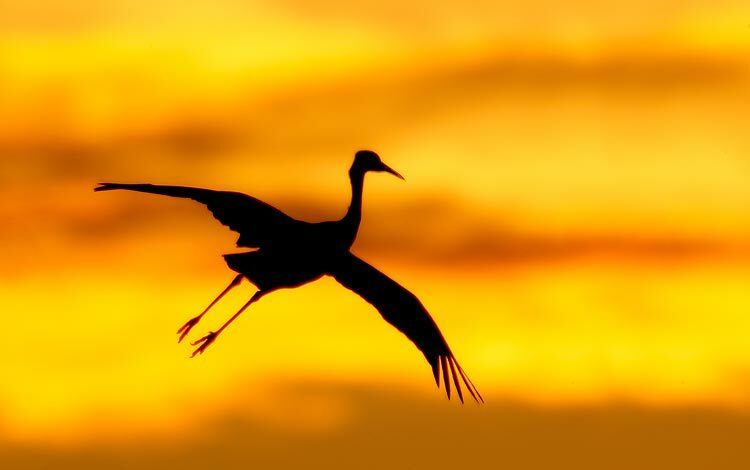 This year’s best was creating both pleasing blurs and sharp silhouetted images of cranes in flight using stacked teleconverters. We were able to focus accurately with both the EOS-1n Mark II and the EOS-Mark III camera bodies. In addition Robert presented an APTATS program for each group detailing his amazing work with Quick Masks. Glenn Wheeler (http://www.glennwheeler.com/) of Arkansas joined my Posse for the first time and was instrumental to the success of the first IPT, offering help to all whenever needed. 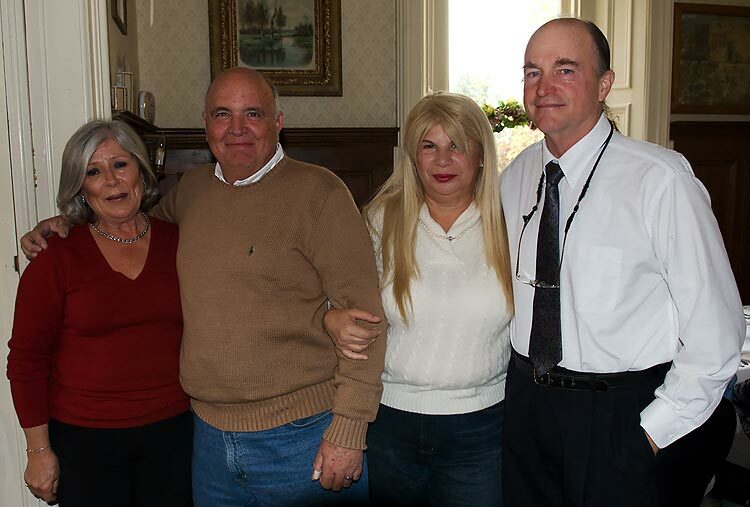 Robert Amoruso, Alfred Forns, and Fabiola Del Alcazar (who became Mr. and Mrs. Alfred Forns at the Thanksgiving luncheon; see more below) were with us for IPTs #2 & 3 and all provided generous help throughout. On several occasions Al and Fabs took folks back to the refuge early while I took advantage of INT (Instructor Nap Time). Their quarry on these forays included the several recently released Aplomado Falcons, hunting Northern Harriers, Northern Pintails, and massed blackbirds blasting off. Thanks to all of the Posse members who helped out at Bosque this year; they are one of many reasons that attending a BAA IPT offers the most intense teaching/learning nature photography experience available anywhere on the planet at any price. Canon 600mm f/4 L IS lens with the EOS-1D MIII. ISO 50. Evaluative metering +1 stop: 1/30 sec. at f/6.3 set manually. There were very few cranes early on and the geese were far from the road but the fall colors were lovely. Thanks also to the folks at the Socorro Super 8 Motel, especially manager Louise Darnell. The Super 8 puts out the earliest breakfast in Socorro and the rooms are always clean, the sheets fresh, and the wake-up calls on time. K-Bobs, which is under new management, has graciously hosted BAA/IPTs for the past six years. We conduct all of our slide programs there, eat all of our lunches there, and enjoy a great fajita buffet on critiquing night. The fajitas and burgers are great as is the salad bar. Without K-Bobs help I would be pretty much dead-in-the-water. Thanks also to Johnny at the Socorro Springs Brewing Company where we held our farewell dinners. I am truly blessed that our IPTs attract so many nice folks and so many excellent photographers. After several last second cancellations, we had 15, 15, and 14 in the three groups. Of the 44 attendees, 19 (43%) were repeat-participants. Diana Zorrilla dew Farias of Monterrey, Mexico attended her first IPT and Robert Malpas, a fine photographer from the UK, attended his third consecutive Bosque IPT and his third consecutive Thanksgiving Luncheon. He is a true recidivist. The North Railroad Pond and the two crane pools offered the best opportunities for all three groups, and on the last day of the third IPT the folks got to enjoy a truly spectacular sunrise replete with various shades of red, yellow, violet, magenta, orange, and even a bit of sky blue. And the geese cooperated majestically flying in and swirling about at the absolute peak of the color. Mid-morning on the first day of the second IPT some folks opted to head back early to the refuge headquarters to get warm. Those who chose to stay with me were rewarded with a spectacular blast off from the cornfield. 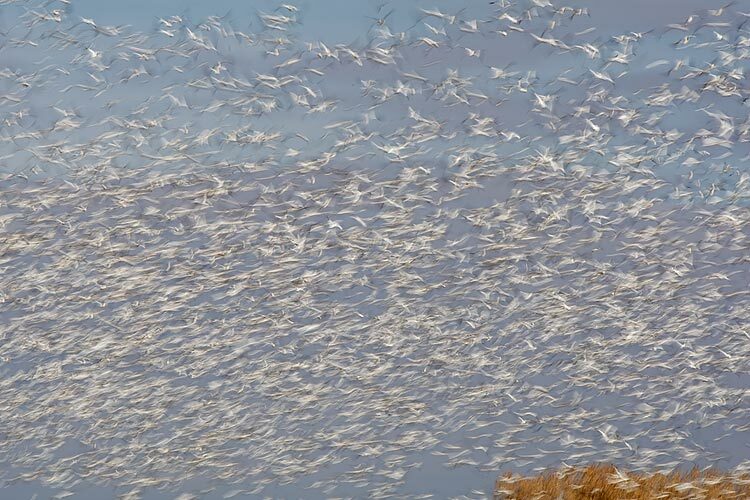 There had been about 8,000 geese in the field when another huge group flew in. 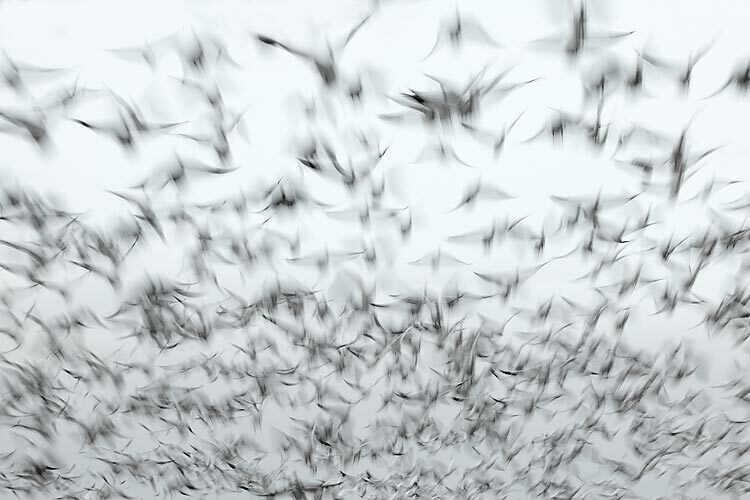 The birds formed a huge, tightly-packed mass of swirling hungry birds and I knew that a blast-off was imminent. We needed to be at our orientation meeting by 10am. At 9:50am I told the remaining folks that if we left no later than 9:55 we would be only a few minutes late. At exactly 9:53 the birds rumbled into the sky to the north in one of the most spectacular blast-offs I have ever witnessed. Thanks to all who attended and again to the Posse members and to the great folks in the eco-tourist friendly town of Socorro, New Mexico. Canon 70-200mm f/2.8 L IS lens (handheld at 115mm) with the EOS-1D MIII. ISO 400. Evaluative Metering +1 stop: 1/30 sec. at f/9. The degree of blurring depends only in part on the shutter speed. 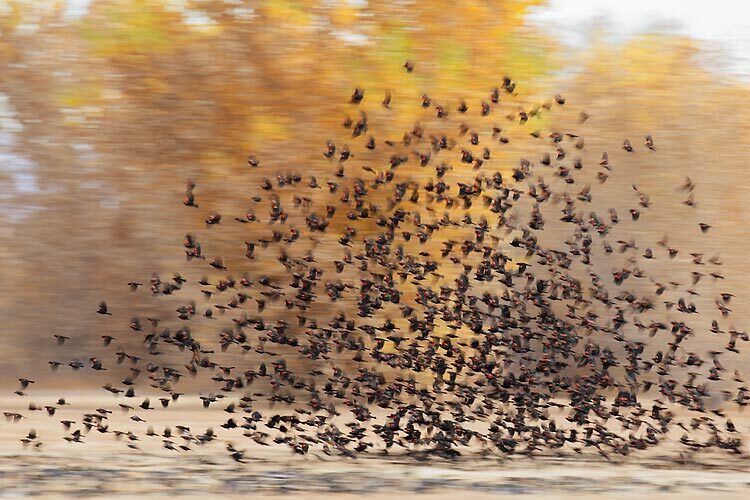 The closer the birds are to your position, the greater the degree of blurring (at the same shutter speed). Note here that the birds at the top of the frame are considerably more blurred than the birds at the bottom of the frame. On the morning of Tuesday, November 27, 2007, I had a great ride-around-the-refuge visit with Senior Biologist John Vradenburg. It seems that I may have finally gotten in touch with the right person and am very optimistic about the future. I look forward to working with John to ensure that photographic opportunities at one of my favorite places on the planet are maximized. During our 90 minute in-the-truck meeting John explained to me in detail what the refuge staff is trying to accomplish with regards to their moist soil management program and the cooperative farming program. I in turn explained the needs of visiting photographers and emphasized that the things that would make photographers happy would not require any great changes or any great challenges to the refuge staff. John explained that with the staff working hard to fulfill some of the requirements of a large federal wetlands program grant, much of the clearing of vegetation along the ditches had been neglected. Even though I was leaving the following day, I suggested that opening up lines of sight near the sorghum field (the triangular shaped field that is currently being inhabited by lots of cranes) and doing the same at the cornfield past the Audio 13 sign would be a wonderful sign of good faith and would improve photographic opportunities drastically. He said that he would do his best to do so. 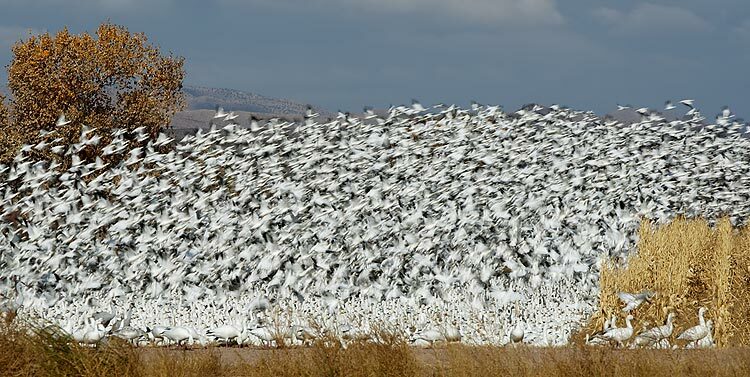 He stated that 18D, the Main Impoundment, would be disked and bulldozed and that by the time that the birds arrive in early fall 2008 18D would be a huge lake. I have been waiting for this since about 1994 and if the plans materialize things should be spectacular next year. John was eager to hear what I had to say and was quite receptive. It is very likely that I will be trying to assemble a team of volunteers to visit Bosque in mid-September to help improve things as needed. If you are seriously interested, please contact me via e-mail. I went out this morning with one of our operators and identified locations to get some of the vegetation knocked down. These are going to be small areas to begin with and I will have the youth groups complete the clearing as time allows. No promises on if the clearing will be completed today for several reasons including a change in bird behavior due to a weather shift that is keeping them in the fields all day and maintenance of the slope mower. We do anticipate that the work will be completed on Monday at the latest but if all goes well this morning they may get some of it cleared this afternoon.. I was thrilled by this news and look forward to working with John in the future to improve photographic conditions at the refuge. It looks as if scenes like this may soon be a thing of the past at Bosque… The vegetation along the ditch at the north end of the refuge was not cut this year as it usually is as the staff was busy with other things. It looks as if two vital areas will be cleared soon. I want to thank you again for the wonderful experience that I had on IPT #2. 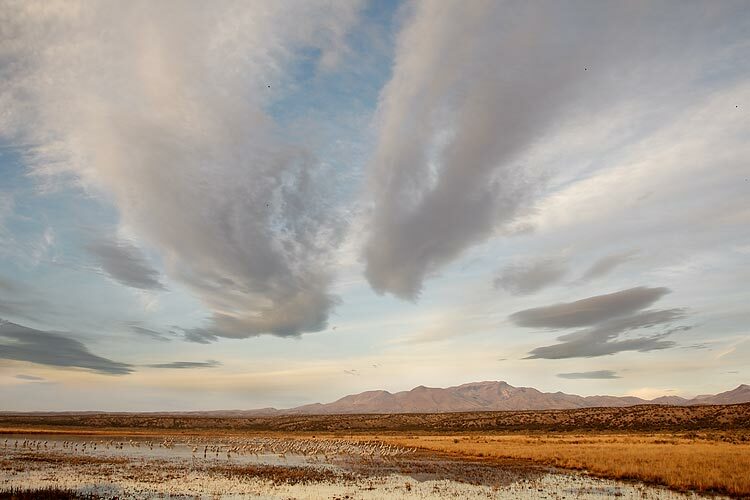 I know that you were—at times-- frustrated with the state of the refuge and the photographic conditions, but, as someone here for the first time, I was blown away by Bosque, by the opportunities it presented, and by your instruction and mentorship. The IPT is something I will never forget. Thanks also to Robert 1 and Robert 2, along with Alfred and Fabs and Andy. It is hard to imagine a more qualified, dedicated and helpful group. Their work was an inspiration to us all. I look forward to attending future IPTs and plan to go on Robert Amoruso's Merritt Island INWR tour in January. Please add me to the bulletin mailing list (I've always read the archives - it's time to commit!) and any short list of folks that you contact in the event of cancellations on IPTs, if such a list exists. After just three days I am beat. Your drive, energy and passion are amazing and infectious. You are a machine! 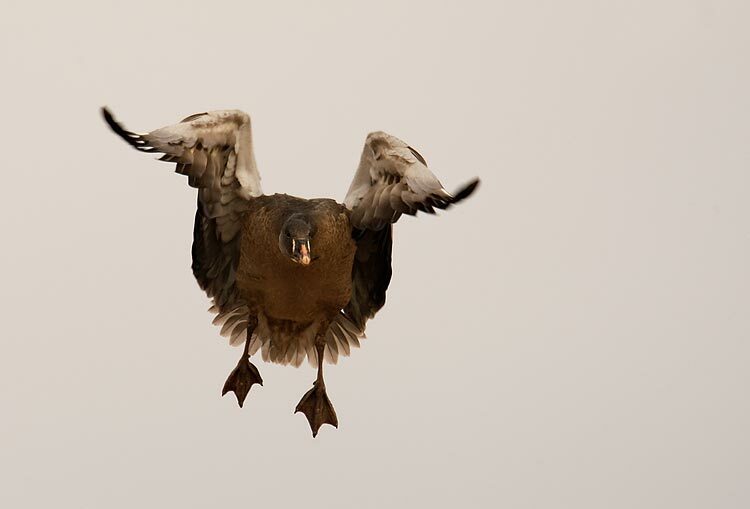 ps - I've attached a copy of my "best back flap ever" image from the Wigeon pond last Monday. I used the techniques that Robert O'Toole shared with us in his APTATS demo to remove a duck head from the bottom left corner. Hope you like it! It was great to see you at Bosque last week. It was nice of you to invite us to the introductory slide show (that was excellent by the way). I found it to be extremely helpful in terms of ideas for shooting strategies at Bosque. In fact, I think we may have gotten more out of it than some of the new people simply because I have gained so much valuable experience from previous IPT’s and I have been able to put what I have learned into practice. You continue to be an outstanding teacher and your willingness to help people learn in all situations is exemplary. I am not sure if most people appreciate just how giving you are with your knowledge and your support but I do because I see it all the time. Your encouragement of my son David is a good example and one for which I am I deeply indebted to you. He thinks you are the greatest but then so do Sharon and I.
Canon 600mm f/4 L IS lens with 1.4X II TC and the EOS-1D MIII. ISO 800. Evaluative metering +2 stops off the sky: 1/1000 sec. at f/6.3 set manually. This bird--which was landing on the maintenance road in front of the corn field—was about to disappear behind a wall of salt cedar and young willows giving the image a rather ethereal feeling. On countless other occasions the tall vegetation was quite frustrating. The Thanksgiving Day luncheon was surely the best ever. For the fourth consecutive year, it was held at the lovely Luna Mansion in Los Lunas with Penny Griego as our host. Alfred Forns and Fabiola Del Alcazar were married in a brief ceremony before lunch was served. A local minister did the deed quickly yet tears of happiness were shed all around. There were 46 guests in attendance. I wish Al and Fabs many decades of loving happiness and togetherness as they continue to make great images and teach others to do the same. Two sweeter folks you have never met; they deserve each other! The updated Bosque Site Guide was sent to the distribution list on Tuesday, November 27. It included up to the minute tips on where and when the very best photographic opportunities might be found in the coming weeks as well as 28 brand new images. If you have previously purchased the Bosque Site Guide but did not receive your update, please send us an e-mail with the words “Bosque Site Guide Update” cut and pasted into the subject line, and please let us know how you paid. Canon 70-200mm f/2.8L IS lens with the 2X II TC and the EOS-1D MIII. ISO 50; 77mm/9 stop neutral density filter. ISO 50. Evaluative metering +1/3 stop: 1/30 sec. at f/10. I purchased your site guide for my first Bosque visit earlier this month. I was quite pleased that I did. It definitely got me up and running at the site much quicker than if had tried to figure it out from scratch. The morning and afternoon shoot strategies were particularly helpful for getting to productive photography quickly. I particularly liked the discussions of wind direction and location as that is something I probably would not have paid as much attention to on my own (and I’ll carry that knowledge to future shoots at other locations). Obviously some of the conditions changed at Bosque from the last edition of the guide, but it was easy to figure out the places that were less productive quickly (like the flight deck) and the guide offered alternatives that panned out nicely. One suggestion would be to add a harrier shooting to the guide; the marsh area across the road from the main impoundment provided regular harrier passes at close range. Take a left after the pay booth and park about 100 yards or so down the road; there is a narrow strip of marsh between the road and far pond. The harriers hunt close to the road there. I had a couple of great late mornings photographing the harriers in that area (though the white festival tents at the visitor center snuck into a few backgrounds). I was surprised to hear that shooting conditions while I was there were poor – as a first time visitor I thought it was awesome! I can’t wait to go back when it’s really good! 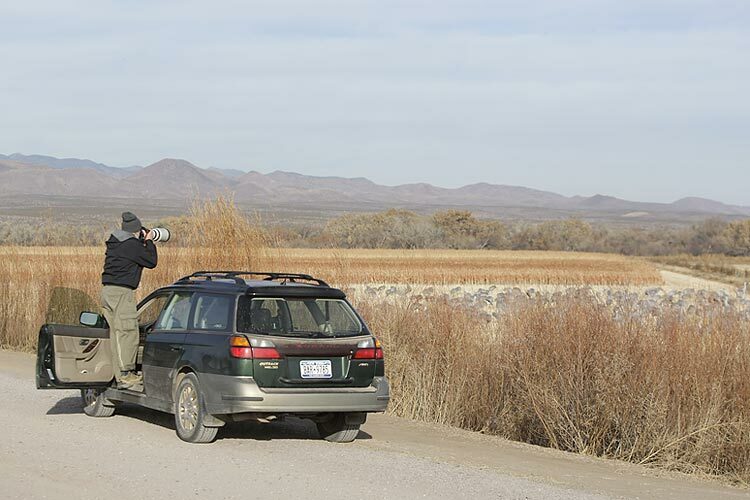 While I was there I heard several stories from other photographers of the work you do to maintain good photography conditions at the refuge – thank you for your efforts, clearly you have made a difference. Canon 500mm f/4 L IS lens with stacked teleconverters and the EOS-1D MIII. ISO 50. Exposure set manually based on past experience: 1/8000 sec. at f/64. The Antarctica Site, Travel, and Logistics Guide PDF on CD is now available. The site guide section covers only the areas that I visited on my cruise to the Falklands, South Georgia, and Antarctica, but the main purpose of the guide is to prepare you for a difficult logistical trip. Which tour do I join? What lenses do I bring? How do I protect my equipment in the harsh environment and more importantly, on the Zodiacs. What do I wear? What about footwear? What about electricity on board? These and dozens more questions will be answered. The 70 page guide includes 73 spectacular images with educational captions. The expected value and productivity of my trip has gone up HUGE as a result of your guide. In my mind the guide is worth $50 eight days a week! That is my final answer! You can order your Antarctica Site, Travel and Logistics Guide (on CD only) today for $50 plus $3 shipping and handling ($53 total) in the US. Florida residents need to add 7% sales tax: $53.50 plus the $3 shipping and handling ($56.50 total). To Canada the cost is $50 plus $6 shipping ($56 total). For overseas customers the cost will be $50 plus $8 shipping and handling ($58 total). Canon 600mm f/4 L IS lens with stacked teleconverters and the EOS-1D MIII. ISO 800. Evaluative metering +1 stop: 1/800 sec. at f/8. Robert O’Toole inspired me to try to create images like with stacked TCs; AF with the central sensor is available in most lighting conditions. In short, the announcement states that folks experiencing AF problems with Mark III camera bodies that fall within a certain serial number range can call an 800# and arrange to have their units sent in to have the sub-mirror assembly adjusted/repaired. It is thought that improperly aligned sub-mirror assemblies may have been causing the reported AF problems. While I had been making mostly sharp images with my Mark III bodies I was amazed at the improved AF performance from the moment I pressed the shutter button for the first time after installing the new firmware. AF locked on securely in all instances; the little green circle in the lower right corner did not flash almost continuously as it had done previously when I was in AI Servo AF mode. And best of all, I was able to track the cranes in flight easily and accurately with 45-point AAFPS even with backgrounds other than sky. There was one instance where I had a crane in the fairly distant crane in the center of the viewfinder against a mountain background and 45-point failed to see the subject at all. All in all, however, I was thrilled with what I experienced; the differences in AF performance were both dramatic and palpable. I only had time to create a few images but nearly every one of the flight images was razor sharp on the eye. Hooray! Do I plan on sending my three cameras in for the sub-mirror fix? Absolutely. I will send one in as soon as I receive the shipping labels from Canon and will send the other two right after I return from my upcoming trip to Panama: 3 days at Canopy Lodge (http://www.canopylodge.com/) and three days at Canopy Tower (www.canopytower.com). I leave on Wednesday, December 5. I will be visiting thanks to a most generous invitation from Raul Arias de Para. 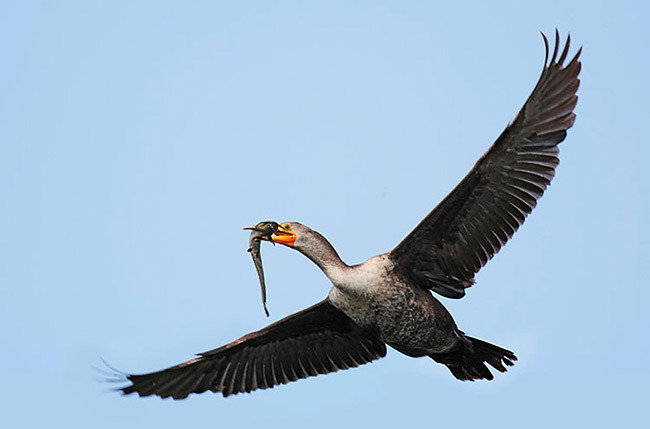 The next BAA Bulletin will feature a trip report and images from this spectacular birding and photography destination. Canon 500mm f/4 L IS lens with the 1.4X II TC and the EOS-1D MIII. ISO 500. Evaluative metering +2/3 stop: 1/800 sec. at f/5.6 set manually. This image was created using 45-point AAFPS after I had installed the new firmware, version 1.1.3. Overall AF performance improved by leaps and bounds. On Monday, December 3, I will be presenting “BIRDS AS ART on the Road” for the Clearwater Audubon Society. The meeting will take place at the Moccasin Lake Nature Park, 2750 Park Trail Lane, Clearwater, FL. All are welcome. For more information, call Program Chairperson, Debbie Trunk at 447-4785 or email Debbie or Paul at ptrunk@gmail.com. I hope to see you there; sorry for the short notice. Canon 24-105mm IS L zoom lens handheld with stacked teleconverters and the EOS-1D MIII. ISO 640. Evaluative metering +1 stop: 1/160 sec at f/5.6. This is an atypical image for me as I usually prefer to work tight with long effective focal lengths. Here, however, the lovely sweeping cloud formations caught my eye. Ah… Winter in Florida! 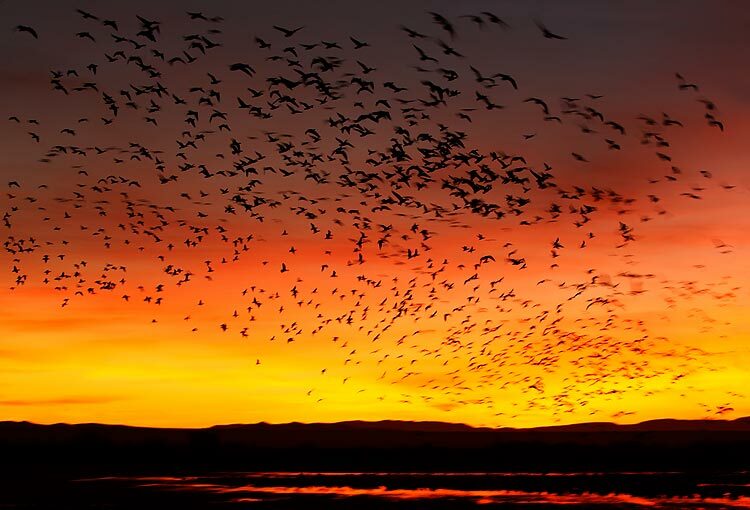 Enjoy warm temperatures, dry sunny days, and an abundance of birds that make Florida their home for the winter. It’s the perfect setting for birds and photographers. Flight School Photography is pleased to announce two “Fly South with the Birds” winter workshops in central Florida. Your instructor and guide, Jim Neiger, is intimately familiar with the region and its avian subjects; he knows the hotspots like no one else. He is the author of the Central Florida Site Guide and several articles about the birds of central Florida. 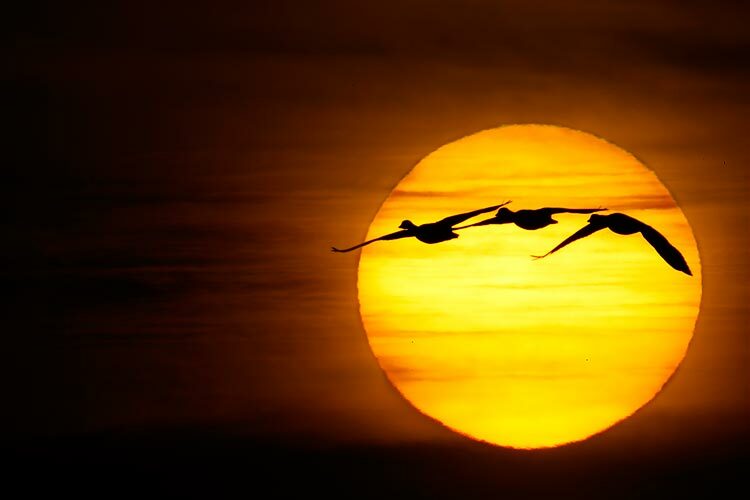 Jim is also well known for his awesome images of birds in flight and for his pioneering work with hand-holding long telephoto lenses (and for teaching others to do the same). Each “Fly South with the Birds” winter workshop will include eight 3-4 hour photo sessions (4 photo sessions on the pontoon boat, and four land-based). A variety of habitats will be visited. Likely subjects include Snail Kite, Bald Eagle, Great Horned Owl, Barred Owl, Red Shoulder Hawk, Crested Caracara, Osprey, Whooping Crane, numerous wading birds, songbirds, woodpeckers, ducks, etc. Click here to view a gallery of sample images. 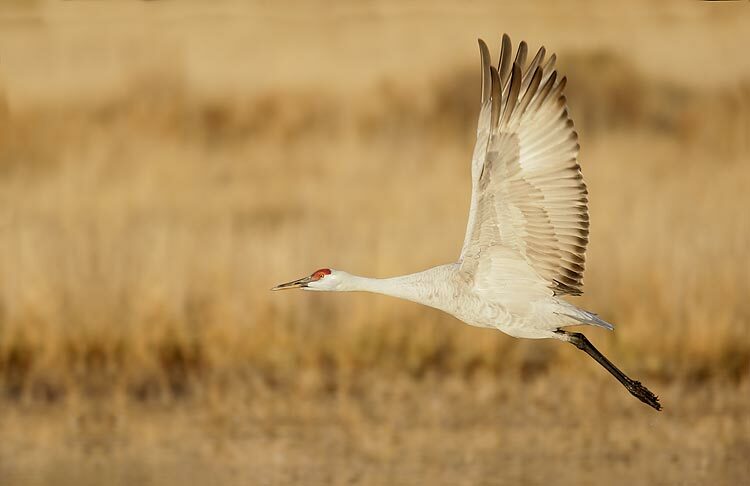 The 5 day Winter Workshops will begin with an afternoon classroom session covering the hand-holding long telephoto lens techniques that Jim has developed for photographing birds in flight and in action. You will also learn to use recorded bird songs to safely increase your photographic opportunities. This will be followed by 4 full days in the field. The group will explore remote and highly productive areas of central Florida and visit a variety of habitats. 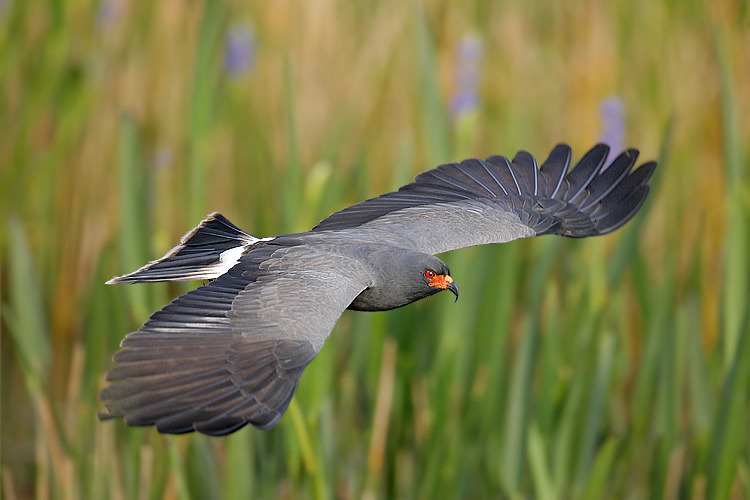 The boat sessions will give us access to several difficult and desirable subjects including and especially Snail Kite, the rarest raptor in North America. Refreshments will be provided during all sessions. Jim’s 2007 pontoon boat was purchased and customized specifically for photography. It is roomy, comfortable, and stable. The boat is equipped with an extremely quiet four-stroke motor for silent cruising. It also has a powerful, silent, electric trolling motor with wireless remote control. This allows Jim to position the boat precisely and noiselessly. The boat can be configured without a top, with a half-canopy to provide shelter from sun and rain, or with a half-enclosure that will completely protect participants from the elements. The boat even has a private changing room with a portable toilet. The boat has capacity for twelve people, but Jim limits the number of participants to 5 so that everyone has room to relax and photograph in comfort. Don’t miss this amazing opportunity. Merritt Island NWR/Viera Wetlands/Canaveral National Seashore Photographic Instructional Workshop: January 11, 12 and 13, 2008. 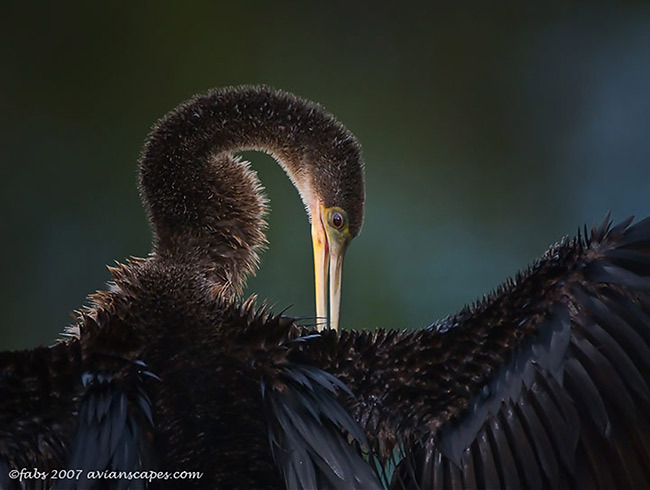 Includes morning and afternoon in-the-field photography sessions at some of the most diverse wildlife and avian photography locations on the east coast of Florida. 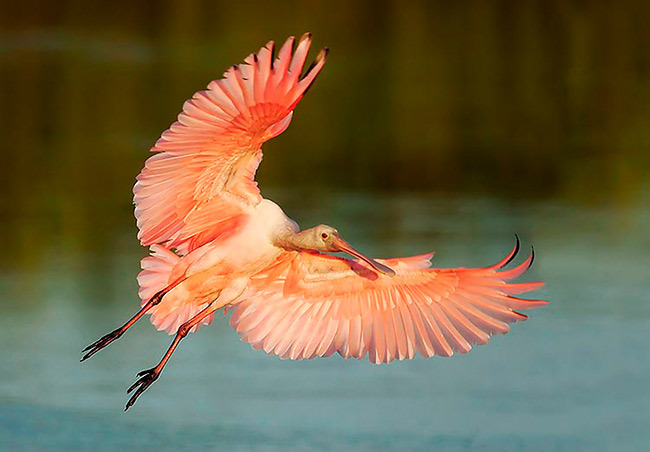 The Roseate Spoonbill is a popular species that will be at MINWR or Viera Wetlands during the workshop. Afternoon and evening classroom instructional sessions will be held. Attendance on this tour includes a free copy of Robert’s BAA/MINWR Area Site Guide. Cost is $800 per person. A 50% deposit is required to hold spot. See Robert’s site at www.wildscapeimages.biz for upcoming workshops. Contact Robert at 407-808-7417 (cell phone) or info@wildscapeimages.com for information on the above. Amazingly, but not so surprisingly (I guess), all regularly scheduled IPTs are currently sold out. If you would like your name added to the waiting list for any of the IPTs below, please e-mail us and be sure to include all of your phone numbers. If you missed out on the scheduled offerings below, do consider purchasing one of our BAA Site Guides (http://www.birdsasart.com/siteguides.htm) or getting a copy of ABP II (http://www.birdsasart.com/ABPII.htm). Or both. You will find each of tremendous value as they include tons of valuable information and instruction. SW FLA President's Holiday IPT: MAR 17-21, 2008 5-DAY: $1669. (Limit 14; Sold Out). Slide program on the evening Sunday, MAR 16, 2007. Co-leaders: Robert O’Toole, Alfred Forns, Fabiola Del Alcazar, & Robert Amoruso. Sanibel Island, Little Estero Lagoon, Venice Rookery, Cape Coral. Herons, egrets, gulls, terns, skimmers, shorebirds, both pelicans, Osprey, Burrowing Owl, and lots more. Canon 70-200mm f/2.8L IS lens with the 2X II TC and the EOS-1D MIII. ISO 50; 77mm/9 stop neutral density filter. ISO 50. Evaluative metering +1/3 stop: 1/8 sec. at f/18. We teach folks to very their shutter speeds when the have a great situation unfold in front of them (and I do as I say). Free shipping is being offered to all of the Birds as Art Subscribers up until December 31st on all orders totaling $500.00 plus. Canon has started to ship the 1DS Mark III in a limited supply. I will do my best to oblige the customers that are currently on the waiting list to supply them with the cameras as soon as possible. Customers that are interested in purchasing the 1DS Mark III that are not on the waiting list must send in full address and telephone number, and Gary Farber will contact you when a shipment is in stock. Canon 1D Mark III updated version has started to ship. If you are interested in receiving one, please send Gary your full address and telephone number, and he will contact you when they are available for purchasing from Hunt’s. Currently a new low price is being offered on the Canon 5D Body. It is being offered to Birds as Art subscribers for $2149.99. Nikon has started to ship the D300, D3, 24-70, and 14-24 lenses. BIRDS AS ART as subscribers who are interested in making a purchase should send Gary Farber their full addresses and telephone numbers and Gary will contact them regarding availability and price. Nikon will start to ship the 500 and 600VR lenses in January or February of 2008. Send Gary Farber your full address and telephone number if you would like to be placed on the waiting list, and Gary will contact you with the current price when they are in stock. Added to Hunt’s terrific prices; Epson is offering tremendous rebates. 5% off Hunt’s every day low price on selective Sigma lens. $25.00 is being taken off of Hunt’s every day low price on Tamron lenses. Please call for specific details. Currently being offered to subscribers is 15% off the Hunt’s regular price on all KATA Rain Covers. In the event Gary Farber is unavailable, we invite you to receive excellent service from a member of our professional sales staff. At our flagship store in Melrose, please ask for Kathryn Nazzaro, Ora Lea, Bob Roach, or Keith Patankar at Tel 800-221-1830 ext. 2360. You will receive the same great prices and service that Gary offers. Canon 600mm f/4 L IS lens with the 1.4X II TC and the EOS-1D MIII. ISO 500. Evaluative metering off dull sky +2 2/3 stops: 1/1000 sec. at f/7.1 set manually. 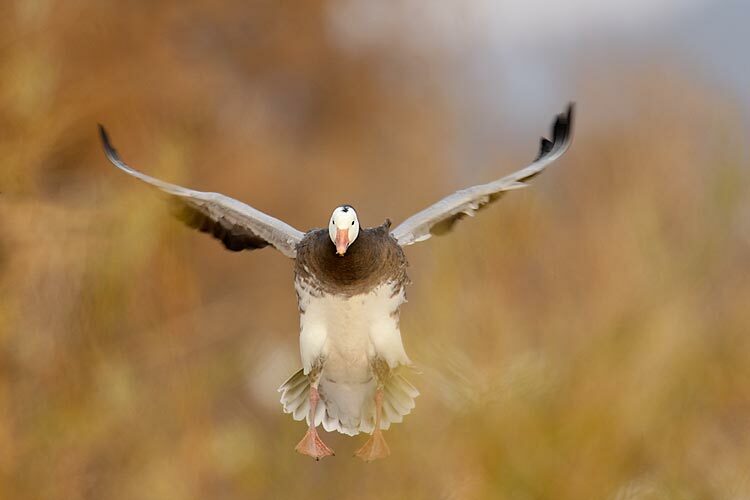 It took me years to create decent image of a young Blue Goose in flight. I opened up a full stop from the manual settings for the cranes to properly expose the goose’s dark tones.